London to Morocco . . .
London today, Tangier tomorrow, by train! This page explains how to plan & book a journey from London to Tangier, Marrakech, Fez, Rabat or Casablanca without flying, in comfort & safety using regular daily scheduled train & ferry services. And what a journey! Take Eurostar to Paris, have lunch at the fabulous Train Bleu restaurant, then speed south to Barcelona at up to 199mph by double-decker TGV Duplex. Stay overnight, then ride superb Spanish high-speed trains through wonderful Spanish scenery into Andalusia, sailing by ferry from Europe to Africa across the Straits of Gibraltar. Once in Morocco, let the real Marrakech Express speed you south towards the incredible High Atlas mountains. No flights, no airports, no stress. GMT (GMT+1 last Sunday in April to last Sunday in September, except during Ramadan). UK & EU citizens do not need a visa to visit Morocco for up to 90 days. Day 1 morning, travel from London to Paris by Eurostar, leaving London St Pancras at 09:22 and arriving Paris Gare du Nord at 12:47. Cross Paris by metro or taxi from the Gare du Nord to the Gare de Lyon, just 2 stops on RER line D. Why not take an earlier Eurostar and have lunch at the wonderful Train Bleu Restaurant inside the Gare de Lyon? If you'd like to spend time in Paris, there are left luggage lockers at both Paris Nord and Paris Gare de Lyon. Day 1 afternoon, travel from Paris to Barcelona by 199mph double-deck TGV Duplex, leaving Paris Gare de Lyon at 14:07 every day and arriving Barcelona Sants at 20:34. Map of Barcelona showing location of the station. There's a café-bar on board. Book an upper deck seat for the best views as the train speeds along the scenic Rhône valley past pretty French villages & picturesque churches, then look out for colonies of flamingos on the étangs in southern France. Stay overnight in Barcelona. Suggested hotels close to Barcelona Sants station with good or great reviews include the Hotel Barcelo Sants (4-star, situated directly above Barcelona Sants station itself, £79-£120 per night), Gran Hotel Torre Catalunya (4-star, £95-£110, across the road from the station, great views from its top floor restaurant), Hotel Just Style (around £105), AC Hotel Sants by Marriott (4-star from around £85, located just 50m from the station), Hotel Catalonia Roma (3-star from £79), Hostal Baler (2-star from £58), Hotel Transit (1-star from £58 per night). Day 2, travel from Barcelona to Algeciras by train: Leave Barcelona Sants by high-speed AVE at 08:30 for Antequera-Santa Ana, change there for a regional train to Algeciras arriving at 17:40. It's a very scenic ride - after the dash along the high-speed line from Barcelona, by-passing Madrid then heading south through Cordoba, you slow right down onto the scenic single-track to Algeciras on the Straits of Gibraltar. You'll see the scenery in this video guide, the video shows a journey from Gibraltar & Algeciras to Madrid, the train from Barcelona passes along exactly the same tracks from the outskirts of Madrid southwards. If you have a Preferente class ticket (but not a Promo fare) you can use the Sala Club at Barcelona, details here. If you like, you can of course spend the night in Algeciras and set sail for Africa next morning (day 3). 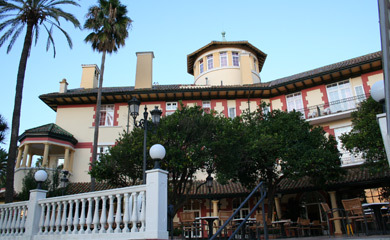 Easily the nicest place to stay is the historic 4-star but relatively inexpensive Hotel Reina Cristina, set in its own grounds 10 minutes walk from both the railway station and the ferry terminal. Algeciras hotel bookings. Map of Algeciras & Gibraltar area. However, there's no reason why you shouldn't continue straight on to Morocco, if you don't mind a late evening arrival in Tangier. Day 2 evening: Take the FRS bus transfer to Tarifa & FRS fast ferry direct to Tangier town: In Algeciras, the modern ferry passenger terminal is a 10-minute (800 metre) walk from the station straight ahead of you. Fast ferry company FRS (www.frs.es) operates a free transfer bus from Algeciras ferry terminal to the pretty town of Tarifa to connect with their modern SeaCat fast ferries from Tarifa to Tangier's original ferry terminal, conveniently located in the heart of Tangier old town just 5 minutes walk from the wonderful Continental Hotel. Sailing times vary by season so check their website, but you'll often find a 21:00 ferry from Tarifa arriving Tangier at 21:00 (remember that Morocco is an hour behind Spain), and if so you can reach Morocco the same day you reach Algeciras if you like. FRS's distinctive red bus leaves from a bus parking space outside Algeciras passenger ferry terminal (Estación Maritima) an hour before each ferry departure from Tarifa. The 22km (14 mile) drive to Tarifa takes 30 minutes, through pretty hills past numerous wind turbines. The FRS ferry may be a better option, involving an Algeciras-Tarifa bus but avoiding the 52 km transfer from Tanger Med Port to Tangier town. It's certainly more romantic arriving at Tangier's old town than arriving at the concrete-and-oil-tanks Tangier Med Port 50km away! 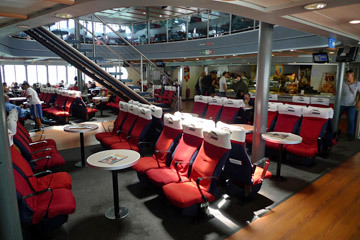 FRS use modern SeaCats with comfortable lounge seating and a refreshment counter. Alternatively, sail from Algeciras Port to Tangier Med Port for bus or taxi to Tangier town... 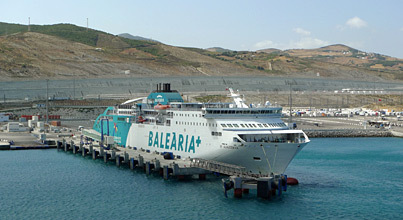 In Algeciras, the modern ferry passenger terminal is a 10-minute (800 metre) walk from the station straight ahead of you. There's no need to book in advance for any of the ferries, just turn up and buy your ticket from one of the many ferry company ticket offices at the entrance to the passenger terminal. 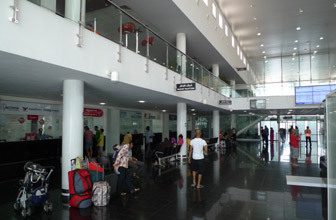 Then go inside the terminal and upstairs to the check-in windows. There are a range of departures throughout the day, operated by a variety of ferry companies. You can choose either a leisurely ship taking 1 hour 30 minutes or a fast ferry taking 50 minutes. You can check sailing times prices for multiple operators using the Direct Ferries form here, or you can check each ferry operator separately at www.comarit.es (ships), www.trasmediterranea.es (fast ferry & ships), www.balearia.com (fast ferry & ships) or www.aml.ma (ships). The fast ferries run by Trasmediterranea & Nautas are more modern & quicker, but you'll be sealed-in except for a windy observation deck at the rear which may or may not be open. The conventional ships are older and slower, but their open decks allow you to enjoy the crossing and take photographs in the open air. 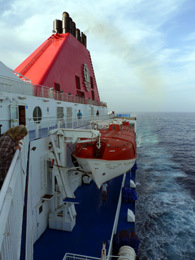 Whichever ferry company you choose, the ferry sails out of Algeciras harbour in a wide arc to starboard with the Rock of Gibraltar to port, then sails across the Straits of Gibraltar into Tangier Med ferry terminal, a new and efficient concrete-and-oil-tanks port some 52 km east of Tangier town. It's a scenic crossing, and you can see for yourself just how narrow the Straits of Gibraltar between Europe and Africa really are, between the two famous 'Pillars of Hercules'! Whichever ferry company you choose, it can help to know that at some point during the crossing you'll need to fill out a white landing card and have it stamped by a passport officer on board. The passport officer may set up shop in a lounge or he may have a small office on board. It's easy to miss announcements about this, and wonder what's happening, so forewarned is forearmed! Also be aware that the ferries regularly run late by an hour or two, so don't plan any tight connections in Tangier, you won't make them! When you arrive at Tangier Med Port, you walk off the ferry and board a free transfer bus which shuttles foot passengers down the road and up the hill to the modern ferry terminal building marked Gare Maritime. You enter the building and pass through passport control and a brief X-ray customs check into the main hall. To get some Moroccan dirhams, there are two ATMs to your immediate left as you enter the main hall. There are toilets in the far left corner. You exit the terminal onto the forecourt to find taxis and buses to Tangier town. Tangier Med Port railway station is directly underneath the ferry terminal building. Option 1, transfer from Tanger Med Port to Tangier town by train, if running... The new railway station at Tangier Med Port opened in June 2013, and comfortable electric trains link the ferry terminal at Tangier Med Port with Tangier Ville station in Tangier town centre at least twice each day, see www.oncf.ma (update: It's possible these trains are not running at the moment, please check locally). 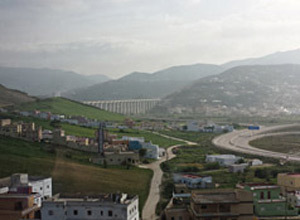 Journey time into Tangier town is 50-60 minutes, the fare just 30 dirhams (£3), and there are onward train connections to Rabat, Casablanca, Marrakech & Fez. The railway station is located downstairs directly beneath the ferry terminal, and trains are definitely running as per the timetable. Note that these Tanger Med Port-Tanger Ville local trains are not shown in the main journey planner on the www.oncf.ma website, although the timetable can be found on the site in pdf format if you hunt for it. 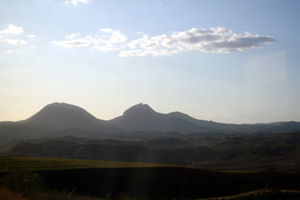 Traveller Andrew Leo reports: "The train journey from Tangier Med to Tangier Ville was a wonderful introduction to Morocco, with the train winding its way slowly through the countryside, past small villages, past Moroccan shepherds with their herds of sheep and across stunning viaducts." Option 2, transfer from Tanger Med Port to Tangier town by bus... Another option is to use the hourly bus from Tanger Med Port to Tangier town run jointly by the ferry companies. Originally free, it's now reported to cost 25 dirhams (about €2.50). It leaves from the Gare Maritime forecourt every hour taking 40-50 minutes for the 52km. According to one report the bus drops you at Tangier's Place Jamia el Arbia (see map of Tangier) but according to other reports (and the official blurb) it goes to the old gate to Tangier's original town port. Option 3, transfer from Tanger Med Port to Tangier town by taxi... A private Grand Taxi from Tanger Med Port direct to your hotel in Tangier town will cost you 300 dirhams or €30 and you'll find plenty of these sand-coloured Grand Taxis (mostly ancient Mercedes) parked to your right as you exit the Gare Maritime. Onwards train travel to Rabat, Casablanca, Meknès, Fez or Marrakech: For onwards travel from Tangier southwards, see the train travel in Morocco section. Of course. The London-Paris Eurostar, the Paris-Barcelona TGV and the Barcelona-Algeciras trains are ticketed as three separate journeys, so feel free to book each leg of the journey on whatever dates you like, spending however long you like in Paris or Barcelona on the way. I'd also consider a stopover at Figueres for the amazing Salvador Dali museum. Dali's home at Port Lligat is just a bus or taxi ride away on the coast, also a museum and well worth visiting. The trains from Barcelona to Algeciras stop at Cordoba and Ronda on the way, both wonderful places to visit. Left luggage facilities at stations. Why not stop off in Madrid or Granada? You can travel from London to Barcelona to Granada as shown on the UK to Spain by train page. See the famous Alhambra Palace, then catch one of the several daily regional trains from Granada to Algeciras, just use www.loco2.com (easy to use, in €, £ or $, no booking fees) or www.renfe.com (see advice on using Renfe.com) or www.petrabax.com (in US$ with small mark-up). Alternatively, travel from London to Barcelona to Madrid as shown on the UK to Spain by train page. There are two daily Altaria trains from Madrid to Algeciras, leaving Madrid Atocha at 08:35 & 15:05, journey time 5h13. Northbound, trains leave Algeciras for Madrid at 08:43 & 15:03, journey time 5h22. See the Morocco to Madrid video here. Bus M-120 links Algeciras bus station (across the road from the station) with La Linea, the frontier with Gibraltar, every 30-45 minutes, taking about 45 minutes, fare about €2.05. You then walk across the frontier through Spanish then UK passport control into Gibraltar (5-10 minutes), then either walk (10-15 minutes) or take a taxi from the taxi stop just inside the border into Gibraltar town centre. The walk or taxi ride takes you across Gibraltar Airport's main runway, but don't worry, they stop the cars and pedestrians when a plane comes in to land! The M-120 bus operator website is www.ctmcg.com. Alternatively, a taxi from Algeciras railway station to La Linea at the gates to Gibraltar costs €24.75 (fixed-price, the Spanish taxis don't use the meter for longer runs like this, and aren't allowed to cross into Gibraltar itself). A fast ferry may occasionally operate from Gibraltar to Tangier (the operator is www.frs.es) but there were only Friday & Sunday evening crossings in 2008 & 2009, check what's happening now at www.frs.es. In most cases, after visiting Gibraltar you'll need return to Algeciras by bus or taxi for the regular ferries from there. What are the trains & the journey like? A Eurostar arrived at Paris Nord... All you need to know about Eurostar. Why not have lunch at the wonderful Train Bleu restaurant in Paris? See the Train Bleu information page. The new Paris to Barcelona service is operated by impressive 186mph TGV Duplex double-decker high-speed trains. 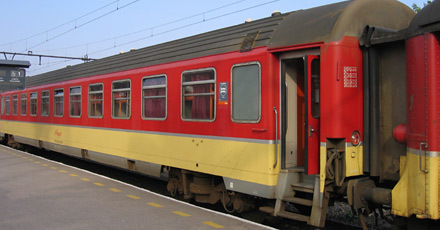 You board the train through a wide sliding external door into a small hall at one end of the lower deck, where an internal door opens into a lower deck seating area. A wide, short & easy flight of stairs leads from the entrance door to a landing at one end of the upper deck. You walk along the train from car to car at the upper level, and the café-bar is also at the upper level. There are toilets both upstairs & downstairs. 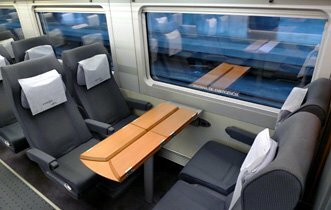 When booking, you can choose a seat on either upper or lower decks if you use www.trainline.eu or www.loco2.com or book by phone, but not if you book at any of the Rail Europe websites. If you have problems with stairs or very heavy luggage, the lower deck might be best. But for the best views (over the top of the occasional sound barrier along the high speed lines! ), definitely choose an upper deck seat. For couples in first class, an upper deck 'club duo' table-for-two is easily the best option. 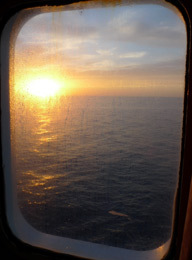 More pictures & an account of what to see on the Paris to Barcelona journey. TGV Duplex at Paris Gare de Lyon. These 200 mph double-deck trains link Paris with Barcelona. Watch TGV Duplex video. 2nd class seats, this is upper deck seating. There's a mix or tables for 4 and unidirectional seating. Crossing the Pyrenees... One of the highest peaks in the mighty Pyrenees, the 2,784m (9,137 feet) Mt Canigou dominates the skyline on the right of the train all the way from Perpignan to Girona. More pictures & an account of what to see on the Paris to Barcelona journey. These superb-quality AVE high speed trains are amongst the classiest trains in Europe. They have three classes, Preferente (premium 1st class seating), Turista Plus (1st class seating but without any food) and Turista (2nd class). AVE trains run at up to 186 mph over the Spanish high-speed lines. Most trains between Barcelona and Andalucia are the S102 type shown below, little articulated single-axle Talgo carriages sandwiched between strange-looking duck-billed power cars, hence the nickname pato, Spanish for duck. The final destination of the Barcelona-Antequera train will be shown on the departure boards as Malaga. All aboard the AVE! This is an S112 AVE high-speed train. 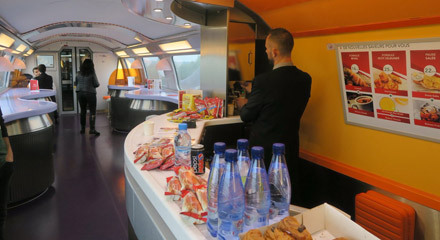 All AVE trains have a cafe-bar serving drinks and snacks, or feel free to bring your own food, wine or beer on board. 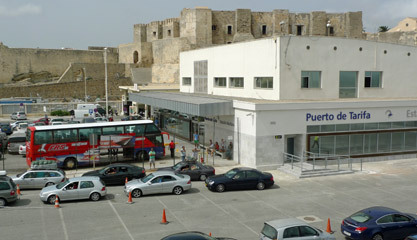 The free FRS shuttle bus leaves from Algeciras' modern Estación Maritima 1 hour before each ferry departure. Inside the FRS fast ferry. There's a refreshment counter selling food and drink, including a welcome cold beer. There are small open-air observation decks at the rear. The FRS fast ferry at tangier town ferry terminal. FRS still use the old Tangier Town terminal, just 5 minutes walk from the Continental Hotel & old medina. A more convenient & romantic place to arrive! See the video! Fast ferries from Algeciras to Tangier Med Port take 50-60 minutes, although you're mostly sealed in. Here, a fast ferry sails out of Algeciras with Gibraltar in the background. 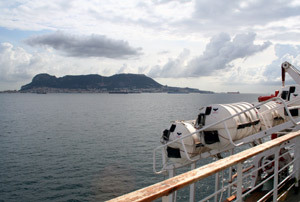 Conventional ferry at Tangier Med Port: Conventional ships take 1½ hours, but their decks allow you to enjoy the crossing of the Straits of Gibraltar in the open air. This is a Balearia ferry. At Tangier Med Port, you walk off the ferry and onto a free shuttle bus which transfers you along the road and up the hill to the terminal building (Gare Maritime) for passport control. Inside Tangier Med Port Gare Maritime are the passport controls, X-ray machines, check-in desks & ATMs. Taxis are waiting outside, plus an hourly free bus to Tangier. The train from Tangier Med Port to Tangier Ville is now up and running... 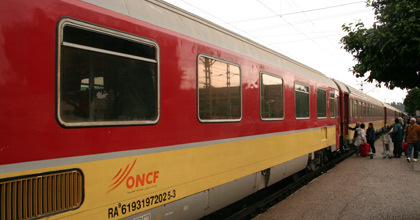 Above left, the 17:30 from Tangier Med Port to Tangier Ville is just a locomotive and two comfortable air-conditioned carriages, connecting with the overnight couchette train to Marrakech, see the timetable below. The station is easy to find, it's located directly below the ferry terminal building, integrated with it. The trains aren't (yet) very frequent, but there are always taxis available as an alternative. Photos courtesy of Andrew Leo. Travel from Marrakesh or Fez to Tangier by train: For train times from Marrakech, Casablanca, Rabat, Fez, Meknès to Tangier, see the train travel in Morocco section below. 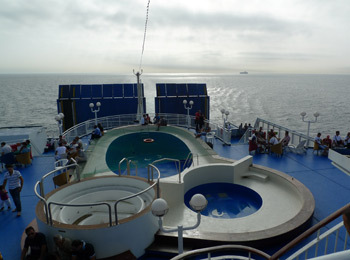 Day 1, sail from Tangier Town to Tarifa by FRS fast ferry & take their free transfer bus to Algeciras, see www.frs.es. The FRS ferry still sails from the old ferry terminal in the heart of Tangier town, just 5 minutes walk from the Continental Hotel. In Tangier, check-in for the ferry is a minimum of 45 minutes, although Moroccan passport checks can be very slow, so get there sooner rather than later. First, exchange your self-print FRS ticket for a boarding pass at the FRS office on the right as you approach the flying-saucer-like ferry terminal, then go upstairs into the terminal for passport control and boarding. 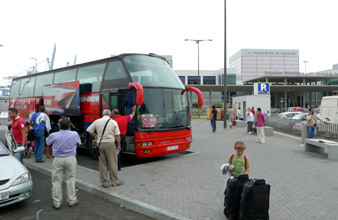 The crossing takes an hour or less, and at Tarifa the distinctive red transfer coach will be waiting outside the small but modern ferry terminal when you emerge from passport control. The 22km (14 mile) drive to Algeciras takes just 30 minutes through pretty hills past many wind turbines. It arrives right in front of Algeciras passenger ferry terminal (Estación Maritima), 10 minutes walk from the railway station or the Hotel Reina Cristina. Alternatively, transfer to Tangier Med Port by train, bus or taxi then take a ferry to Algeciras... In the afternoon or evening, take a train, bus or taxi from Tangier town to Tangier Med Port. Since May 2010, all ferries to Algeciras leave from the new ferry terminal at Tanger Med port (Port Tanger Mediterranée, see map), located some 52 km east of Tangier town itself. A rail link from Tangier Ville station to Tangier Med Port opened in June 2013, journey time 50-60 minutes, with connections from Marrakech, Casablanca, Fez and Rabat, see www.oncf.ma (update: It's possible these trains are not running at the moment, please check locally). The station at Tangier Med Port is directly below the ferry terminal building, integrated with it. The ferry companies also run an hourly bus, fare €2.50, according to one report departing from Place Jamia el Arbia (see map of Tangier), according to others departing from the old main gate to Tangier's original town port. A taxi from Tangier town to Tangier Med Port costs 300 dirhams or €30. At Tanger Med Port's modern Gare Maritime there are ferry company ticket offices and check-ins, you pass through passport control and customs, then a free transfer bus shuttles you down the hill to the actual ferry dock before each ferry departure. Once at Tangier Med Port, on most days there's a Comarit ship which sails at 18:00 arriving in Algeciras at 20:30/21:30 and another at 20:00 arriving Algeciras at 22:30/23:30 (Spain is normally an hour ahead or Morocco, but at certain times of year is 2 hours ahead). By all means take an earlier ship or fast ferry if you want more of an evening relaxing in Algeciras at the recommended Hotel Reina Cristina. It's a 1hour 30 minute crossing by ship or around 1 hour by fast SeaCat. You can check sailing times prices for multiple operators using the Direct Ferries form here, or you can check each ferry operator separately at www.comarit.es (ships), www.trasmediterranea.es (fast ferry & ships), www.balearia.com (fast ferry & ships) or www.aml.ma (ships). If you use Tanger Med and have any feedback, please email me. Day 1, spend the night in Algeciras, ideally at the characterful Hotel Reina Cristina set in its own grounds a 10 minute walk from both the station and ferry terminal. I suggest spending the night in Algeciras for a good reason: It may seem tempting to use a morning ferry the same day your train leaves Algeciras, but the ferries often run an hour or two late, sometimes more, so same-day connections between ferry & train in Algeciras are not recommended! Day 2, travel from Algeciras to Barcelona by train. You leave Algeciras at 11:45 by regional train to Antequera-Santa Ana and change there onto a high-speed AVE train which passes through Cordoba, by-passes Madrid and arrives Barcelona Sants at 20:22. You'll see the same wonderful scenery shown in this Gibraltar to Madrid video guide, the train to Barcelona takes exactly the same route as far as the outskirts of Madrid. Day 3, morning, travel from Barcelona to Paris by double-deck high-speed TGV Duplex, leaving Barcelona Sants at 09:25 and arriving Paris Gare de Lyon at 15:53. Book an upper deck seat for the best views as the train rolls past colonies of flamingos on the étangs in southern France, then speeds along the scenic Rhone Valley towards Paris. There's a cafe-bar on board. 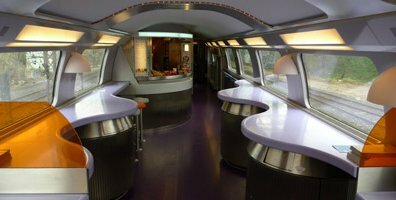 If you have a 1st class ticket for the TGV you can use the Sala Club at Barcelona, details here. Cross Paris by metro or taxi, just 2 stops on RER line D. Why not have an early dinner in Paris and catch a later Eurostar? The Brasserie Terminus Nord (www.terminusnord.com) is good and typically French, and it's directly opposite the Gare du Nord. Day 3 early evening, travel from Paris to London by Eurostar. A Eurostar leaves Paris Gare du Nord at 18:07 (19:07 on Saturdays) arriving London St Pancras at 19:39 (20:39 on Saturdays). You can't buy a London to Morocco ticket, the cost is the sum of the tickets for each individual part of the journey. London to Paris by Eurostar starts at £44 one-way or £58 return in 2nd class, £112 one-way or £168 return in 1st class. More details here. 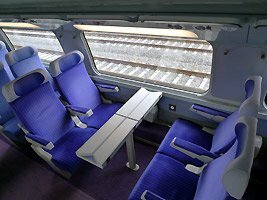 Paris-Barcelona by TGV starts at €39 each way in 2nd class or €59 in 1st class. More details here. Barcelona to Algeciras by AVE+regional train starts at around €55 each way in Turista. Check fares using www.loco2.com or www.renfe.com. 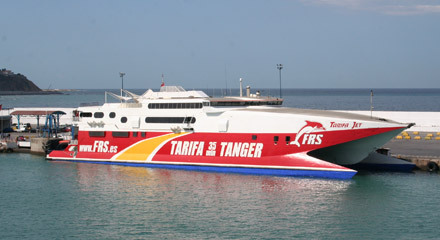 Tarifa to Tangier starts at €18 each way with FRS, with free transfer bus to/from Algeciras ferry terminal. Fares for each of these trains vary like air fares, rising as the cheaper tickets are sold. Book early for the cheapest fares. The easiest & cheapest way to book a London-Morocco train journey is online. You can book a one-way or round trip in either direction. When do bookings open? Bookings for Eurostar & the Paris-Barcelona TGVs usually open 120 days ahead. Eurostar sometimes opens up to 180 days ahead but I recommend waiting so you can at least confirm times & prices for the Paris-Barcelona TGV before committing to a non-refundable Eurostar ticket. Spanish AVE trains should open 90 days ahead, but this can vary as Renfe releases dates in blocks pretty much when it feels like it. By all means book London-Barcelona as soon as bookings open and wait to book the Barcelona-Algeciras part of the journey later. Eurostar, TGV & AVE fares work like air fares so book as early as you can for the cheapest prices. Step 1, go to www.loco2.com and book from London to Barcelona & back by Eurostar & TGV following the simple instructions on the London to Spain page. Anyone from any country can use Loco2, it accepts international credit cards and issues print-at-home or collect-at-station tickets. Add this ticket to your basket. Step 2, still on www.loco2.com, book from Barcelona to Algeciras & back and add this to your basket. Now check out and pay for all your train tickets together as one transaction. Tip: Click More options and add Antequera Santa Ana as a via station. Note: The limiting factor is sometimes the local train Antequera-Algeciras which only opens for booking 60 days before travel, and often less than this, which stuffs a Barcelona-Algeciras booking. 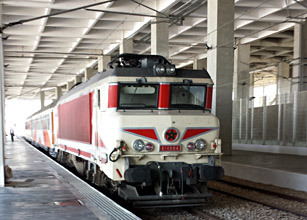 If there's a problem, simply book the AVE between Barcelona and Antequera-Santa Ana, and come back to book the Antequera-Algeciras local connection a few weeks before travel. Step 3, buy a ferry ticket from Algeciras or Tarifa to Tangier. Tickets for the ferry can easily be bought at the ferry terminal when you get to Algeciras as there are regular ferries and always places available, but you can sort out your ticket before you go if you like. The easiest way to check sailing times and prices for all ferry operators on the Spain-Tangier route is on the seat61 ferry shop. Alternatively, assuming you're going to use the FRS fast ferry from Tarifa you can of course book online direct with FRS at www.frs.es. You make the booking between Tarifa & Tangier, their free Algeciras-Tarifa transfer bus cannot be pre-booked. You can also make this journey using an InterRail pass, this option is explained below. But it isn't usually any cheaper unless you're under 28, and is more hassle to arrange than simply buying regular tickets online. However, a pass does give more flexibility than inflexible cheap advance-purchase tickets. To buy tickets from London to Algeciras by phone, call International Rail on 0844 248 248 3, lines open 09:00-17:00 Monday-Friday. Overseas callers call +44 844 2482483. Unlike some other agencies, International Rail are equipped with both the French and Spanish rail ticketing systems, so can sell the cheapest fares for all the trains from the UK to Gibraltar. They charge a £10 booking fee for bookings under £100, £20 for £100-£300, £30 above £300. Eurostar, Trainhotel & Renfe tickets will usually be emailed to you as e-tickets, so there's no postage fee or delay. 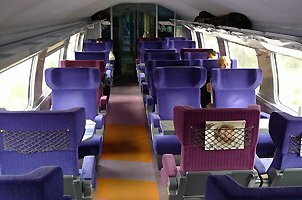 For more information on buying European train tickets, see the How to buy European train tickets page. If you simply want to travel to and from Morocco, forget railpasses, just buy cheap advance-purchase tickets as explained above, as a railpass is unlikely to save any money over these especially once you add the extra passholder reservation fees. However, if you are under 28 the youth InterRail pass may be almost as cheap as advance tickets even with the reservation fees included and better value as it gives flexibility. InterRail passes are available to any European resident and give unlimited train travel across much of Europe including France & Spain, but no longer cover Morocco. They don't give free travel in your home country, so if you're a UK citizen an InterRail won't give free travel on UK trains. Nor does any InterRail pass give free travel on Eurostar. Overseas visitors qualify for Eurail passes rather than InterRail, but as Eurail passes are less good value than InterRails I'd suggest sticking with regular tickets for this journey as explained above. A 7-days-in-1 month InterRail pass will get you to the Straits of Gibraltar and back with several spare days in hand for stopovers or side trips, 2017 prices for this pass are £255 adult, £199 youth (under 28), £229 senior (over 60). See the InterRail pass page to check global InterRail pass prices & buy online. You will need to add a Eurostar passholder fare from London to Paris, €30 each way in standard with a 2nd class pass. 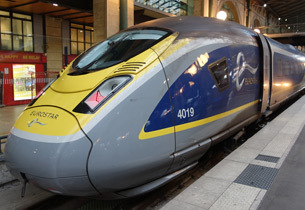 More information about Eurostar passholder fares & how to buy them. You will need to budget for the following passholder reservation fees: Paris-Barcelona £16 in 2nd class, £22 in 1st class. 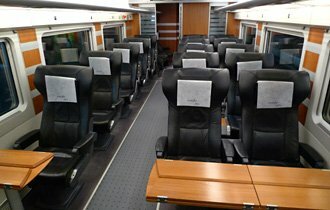 AVE train Barcelona-Antequera €10. If you live in the UK you can make these reservations after buying your pass using the passholder reservation feature on en.oui.sncf/en/pass/seat-reservation. Passholder places on the Paris-Barcelona TGVs are limited by quota, so book as early as you can. If you find passholder places sold out, try splitting the booking or using an alternative route. You'll still need to pay for the ferry to Morocco and trains in Morocco. 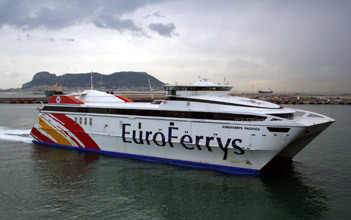 Either buy the ferry ticket when you get to Algeciras as this is easy, or book the FRS ferry from Tarifa at www.frs.es. See for yourself how straightforward, comfortable and scenic a Morocco to Europe journey can be by train & ferry. The video shows a journey on the FRS fast ferry from Tangier to Tarifa and the train ride from Algeciras to Madrid. 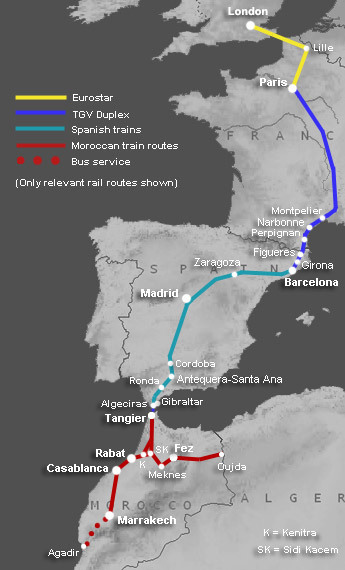 This is an attractive alternative to the route via Algeciras. Indeed, with a day exploring Barcelona then a cruise to Tangier, it's a holiday in itself. However, it's not daily and not necessarily cheap, given the cost of the cruise ferry. Grandi Navi Veloci operate superb regular cruise ferries from Barcelona to Tangier up to 3 times a week, with Grimaldi Lines also running a cruise ferry once a week. Travel from London to Barcelona by Eurostar & TGV, arriving at 20:34, see the London to Spain page. You may need to stay overnight, a same-day connection is sometimes possible depending on the ferry time and required check-in time. Check Grimaldi Lines sailing dates and times at www.grimaldi-lines.com. Their cruise ferry usually sails at 23:59 on Sundays (which could be your day 2 from London) arriving Tangier at 10:30 on Tuesdays (day 4 from London). Check the required check-in time carefully. Check Grandi Navi Veloci ferries at www.gnv.it. GNV's ferry usually sails on Tuesdays at 17:00, on Fridays at 10:00 and on Sundays at 14:00, arriving at Tangier 26 hours later. With a departure at 17:00 or 14:00, a departure from Barcelona on day 2 is possible, getting you to Tangier day 3. With a 10:00 departure, the connection with the sleeper from Paris is too tight, so you'd sail on day 3, arrive Tangier day 4 from London. Both companies' ships are true cruise ferries, with comfortable cabins with en suite toilet and shower, swimming pools, self-service and a la carte restaurants, cinema and bars. Having said that, don't be surprised to see many Moroccan families who haven't paid for a cabin, camped in the hallways! As a rough guide, Barcelona to Tangier one-way for two people sharing a 2-bed cabin in May might cost €232, in other words €116 per person. See the Spain page for details of prices London-Barcelona. To buy tickets, start with the ferry, as they only sail on certain days but the trains run daily. Book either ferry online at the Seat61 Ferry Shop or book the Grandi Navi Veloci ferry at www.gnv.it, Grimaldi Lines at www.grimaldi-lines.com. Then book the trains from London to Barcelona as shown on the Spain page. Day 1: To check Grandi Navi Veloci's sailing days and times, see www.gnv.it. The cruise ferry usually sails on Mondays at 23:00, on Wednesdays at 23:00 and on Saturdays at 16:00. The 23:00 departures arrive in Barcelona around 08:00 two nights later (day 3), the 16:00 departure arrives at 19:00 one night later (day 2). Day 1: To check Grimaldi Lines sailing days and times see www.grimaldi-lines.com. Grimaldi usually sail from Tangier on Tuesdays at 17:00, arriving Barcelona at 20:00 on Wednesdays. Don't risk any tight connections, stay overnight in Barcelona! Day 3: Travel from Barcelona to London by TGV & Eurostar, arriving London in the evening, see the London to Spain page. If you prefer a longer sea voyage, there are regular passenger ships from Sète in the South of France to Tangier, originally run by Comanav (Compagnie Maroccaine de Navigation), now taken over by the Italian ferry operator Grandi Navi Veloci. See www.gnv.it for sailing dates, fares & online booking. 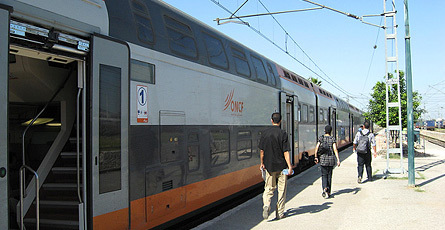 It's easy to get from London to Sète by train - You can check train times & buy tickets online at www.loco2.com. Allow several hours minimum to connect in Sète, if necessary staying overnight. In Tangier, easily the most interesting & atmospheric place to stay is the venerable Continental Hotel, whatever your budget, and it's one of my favourite places. If you arrive by FRS fast ferry from Tarifa, you'll easily spot it on your right high up on the edge of the Medina as you walk into town. Opened by a British family in 1888 and used by many famous people including (allegedly) Winston Churchill and Queen Victoria's son Alfred, it's now a travellers' favourite, with classic Moroccan décor and an atmosphere straight out of Agatha Christie - indeed, it's been used as a film location at various times. In spite of all this history, it's cheap, a single room with shower & toilet costs around 595 dirhams (£49) per night including a light breakfast, a double room with shower & toilet around 735 dirhams (£61) including breakfast. 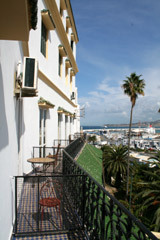 Ask for a room on the first floor with a balcony overlooking the port and new town. Rooms are fairly basic, only a handful have A/C, but they have clean en suite showers & toilets, the hotel is handy for the FRS ferry, superbly located inside the old medina walls a stone's throw from the old town centre, Petit Socco & Grand Socco. The hotel now has free WiFi and 24 hour reception. It has a good and cheap restaurant for lunch and dinner, too, although alcohol isn't served. 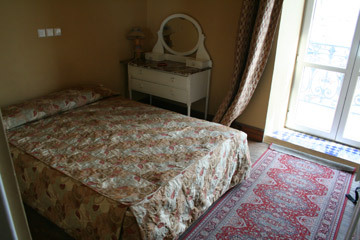 Rooms can now be booked online at Booking.com. Or just turn up, they usually have rooms available. The address is 36, Dar Baroud (Medina), Tangier, tel +212 39 93 10 24. 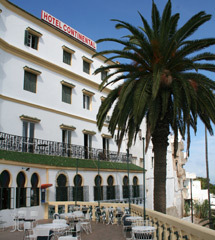 The Continental Hotel, Tangier. In the middle picture, the FRS Tangier-Tarifa ferry port is in the background. Tangier sometimes gets a bad press from travellers who are hassled by a few touts at the port, who then hurry through without seeing it and tell everyone else to do the same. This is very short-sighted, as Tangier is the intriguing and atmospheric city where Europe meets Africa. Indeed, fans of the film 'Casablanca' will find it a far more plausible setting for Rick, Elsa, Captain Renault and Major Strasser than the big and unremarkable city to the south. Tangier was an international zone from 1923 until its incorporation with Morocco in 1956, and it really was awash with spies from both sides in world war 2. It retains a faint air of mystery and intrigue even today, although I've always felt very safe there! It's a wonderful and fascinating place to spend a day or two, so make sure you include it in your itinerary. Make sure you see the medina (old town), kasbah (fort), the Petit Socco (small square, be sure to have a coffee or mint tea here) and Grand Socco (large square), the lovely English Church, and Tangier American Legation museum (the first bit of overseas territory ever acquired by the United States). For more information on Tangier, see http://en.wikipedia.org/wiki/Tangier. 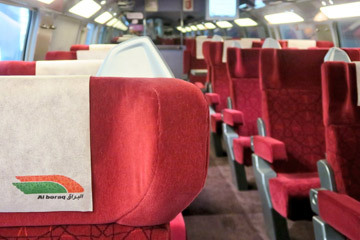 Modern air-conditioned trains are waiting to whisk you south to the rest of Morocco. Rabat is the country's capital and well worth a stop; Casablanca is certainly a name to conjure with (you have to say you've been there!) but in reality it's just a large city. Marrakech is the obvious destination, and a worthy (if touristy) one. 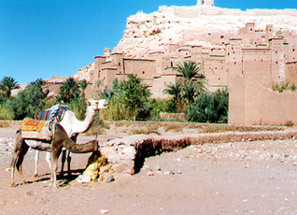 Why not hire a car for a few days and explore the country south of Marrakech? Meknès & Fez are amazing places, as good or better than Marrakech an with fewer tourists, so don't miss them! The trains in Morocco are some of the best in Africa, and they're the ideal choice for getting around between cities. Brand new 300km/h (186mph) Al Boraq high-speed trains link Tangier, Kenitra, Rabat & Casablanca using a new high-speed line. A few air-conditioned trains every day still link Tangier with Sidi Kacem via the old classic-speed line. Fast, modern, air-conditioned trains then run Oujda-Fes-Meknes-Sidi Kacem-Kenitra-Rabat-Casablanca-Marrakech, see the route map above.. Most of these conventional expresses have now been branded Al Atlas. 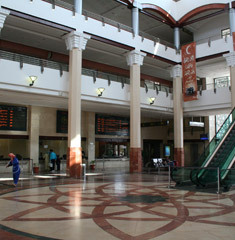 Regular trains link Casablanca airport with the city centre, and Trains Navette Rapides (fast shuttle trains) link Rabat & Casablanca. 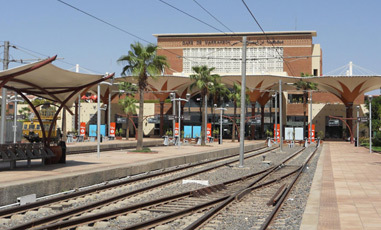 Agadir and Essaouira have no railway station, but are linked to Marrakech by connecting bus. You can easily check Moroccan train times & fares at the Moroccan Railways (ONCF) website, www.oncf.ma, English button top right. Fares are pretty cheap by European standards, see fare examples below. Fares for the Al Boraq high-speed trains have variable pricing in 2nd class, with cheaper advance-purchase non-flexible fares and more expensive flexible fares. This policy has now been extended to most conventional long-distance trains too, which have been branded Al Atlas. At short notice the more expensive flexible fares will apply. Children aged 0-3 travel free, children aged 4-10 travel at half fare, children aged 11 and over pay the adult fare. Journey time 1h20 by Al Boraq high-speed train. Departures from Tangier at 05:55, 07:55, 09:55, 11:55, 13:55, 15:55, 17:55, 18:55, 20:55. Rabat Agdal is the station you want for high-speed trains, only conventional non-high-speed trains call at Rabat Ville. 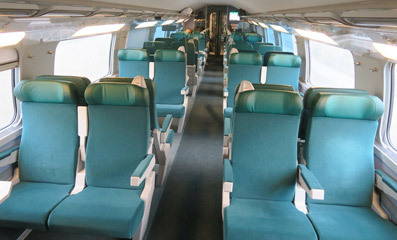 Fares vary between 89 to 172 dirhams 2nd class, the fare is 224 dirhams in 1st class. Journey time 2h10 by Al Boraq high-speed train. Casa Voyageurs is the main station for high-speed trains. Fares vary between 99 to 224 dirhams 2nd class, the fare is 292 dirhams in 1st class. Option 1, by daytime train: Take an Al Boraq high-speed train from Tangier to Kenitra (or on the 11:55 departure, Tangier to Casablanca Voyageurs) then a classic Al Atlas train onwards to Marrakech. Departures from Tangier at 06:55, 08:55, 11:55, 14:55, 16:55. Journey time around 5h20. Fares vary between 186 to 338 dirhams 2nd class, the fare is 472 dirhams in 1st class. Option 2, by direct overnight train, leaving Tangier at 21:55 & arriving Marrakech 07:19. 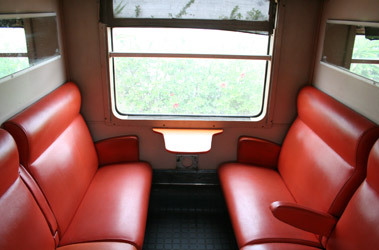 The train has 4-berth 1st class couchettes & ordinary seats, see the Tangier-Marrakech overnight train section below. The fare is 216 dirhams in 2nd class, 327 dirhams in 1st class, or around 375 dirhams in a 1st class couchette. Option 1, journey time around 3h40 taking an Al Boraq high-speed train from Tangier to Kenitra then a classic Al Atlas train eastwards to Fes. Departures from Tangier at 05:55, 06:55, 11:55, 16:55, 18:55, 20:55. Option 2, journey time around 4h50 via the classic line, taking a classic Al Atlas train from Tanger to the junction at Sidi Kacem, then another classic Al Atlas train to Fes. Departures at 07:45, 11:45, 17:50. Option 1, journey time around 2h40 taking an Al Boraq high-speed train from Tangier to Kenitra then a classic Al Atlas train eastwards to Fes. Departures from Tangier at o5:55, 06:55, 11:55, 16:55, 18:55, 20:55. Option 2, journey time around 4h05 via the classic line, taking a classic Al Atlas train from Tanger to the junction at Sidi Kacem, then another classic Al Atlas train to Fes. Departures at 07:45, 11:45, 17:50. In theory you can book Moroccan long-distance trains online at www.oncf.ma, but so far it only works with Moroccan credit cards. There's always a chance this will change at some point, so give it a try - feedback if you succeed would be appreciated, so far nobody has! When you're in Morocco, you can also book by phone on 0890 20 30 40, but this number is not accessible from overseas. Booking opens one month before departure. It's easy enough just to buy your ticket at the station on the day, or perhaps the day before. 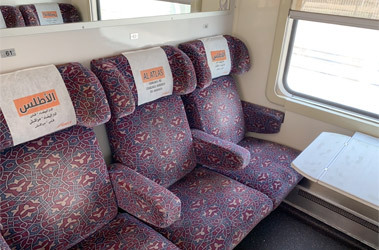 On both the Al Boraq high-speed trains and the classic Al Atlas trains, all tickets come with a reserved seat so trains can in theory sell out, but there are so many seats that in practice they seldom do. The Al Atlas trains have only one first class car, and that can indeed sell out on occasion. 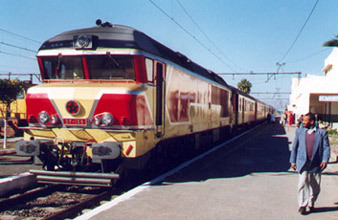 The shuttle trains linking Rabat & Casablanca and the few remaining conventional long-distance trains which have not yet been branded Al Atlas have unreserved 2nd class where tickets do not include a reserved seat so tickets cannot sell out, you sit where you like on a first come, first served basis. Sleeping-berths (4-berth couchettes) on the convenient Tangier-Marrakech overnight train can be reserved up to 2 months in advance and these do sometimes get fully-booked as there's only one couchette car on the train, so book as soon as you reach Morocco, but it's reportedly sometimes possible to find berths available on the day of travel. Marrakech Tickets: www.marrakechtickets.co.uk - tickets for daytime trains can be emailed to you, tickets for the overnight couchette train can be collected in Marrakech or for departures from Tangier couriered to you for around £35. Travel link: One seat61 correspondent suggests arranging couchette tickets on this train through local travel agency Travel Link (www.travellink.ma, 83 Rue de la Liberté (next to the El Minza Hotel), Tanger, call +212 539 93 58 77 or email both officetanger@travellink.ma & imad@travellink.ma, though reports about this agency have been mixed, see below. You can also try similar agency www.andotravel.com. The old station in Tangier near the port & medina was closed a few years ago (it's now used as a police station), but an impressive new Tanger Ville station has now been completed just inland from the far end of the sea front. Walking from the port, the medina or the Continental Hotel to the new station takes around 30-35 minutes, so take a petit taxi as this only costs 20 dirhams or so (about £1.70). Currently the station is a construction site, readying it for the new high-speed trains. 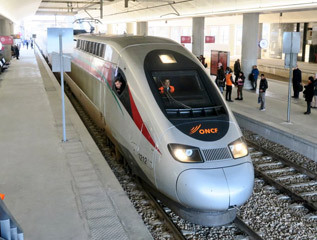 Africa's first high-speed trains started running in November 2018 on the new Tangier-Rabat-Casablanca high-speed line. 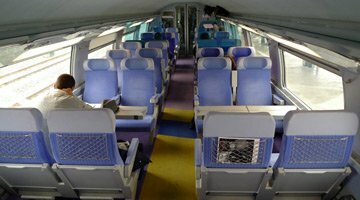 Morocco's Al Boraq high-speed trains are 300km/h (186mph) double-deck trains, basically a version of French Railway's TGV Duplex. They have 1st & 2nd class and a cafe-bar. The new line roughly follows the route of the (still-operating) classic line, but joins the Fes-Casablanca main line at Kenitra rather than Sidi Kacem. The classic long distance trains have smooth-riding 1st & 2nd class air-conditioned coaches, with a trolley selling tea, coffee, sandwiches & snacks. Most of these classic expresses have now been branded Al Atlas, with a reserved seat automatically included with every ticket. The few remaining classic expresses which have not yet been branded Al Atlas have reserved seats in 1st class but no reservation possible in 2nd class. 1st class is very comfortable indeed, with plush carpeted 6-seat air-conditioned compartments or occasionally open-plan seating. It's still cheap, and well worth the extra over 2nd class. First class tickets include a specific reserved seat, so can sometimes sell out. A refreshment trolley sells inexpensive soft drinks, snacks and excellent hot sweet coffee! The overnight train is a popular and time-effective way to travel from Tangier to Marrakech, sleeping in a couchette and saving a night in a hotel. 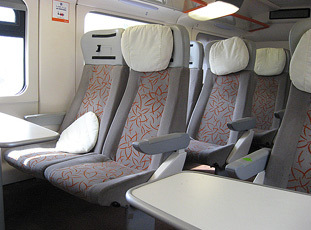 One couchette car is attached to this train, with eleven 1st class 4-berth compartments, each berth provided with pillow, sheet and light blanket. The car is air-conditioned, although it may be a while before the air-con kicks in if the car has been standing in the sidings all day! The compartment doors lock securely, and it is a safe, comfortable and time-effective way to travel. As there is only one couchette car, berths can get sold out, so book ahead if you can. However, it's not impossible to find berths available even if you book at the station on the day of travel, so give it a try. 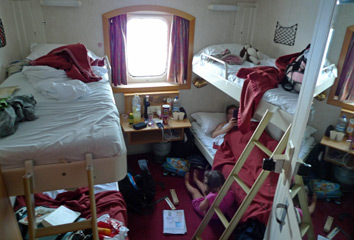 All compartments are shared 4-berth, sharing is absolutely fine and normal, though if you are not on a tight budget and there's only 1, 2 or 3 of you, you can book all 4 places in a compartment for private occupancy. How to book the Tangier-Marrakech couchette train from outside Morocco: There's no direct way of booking this train from outside Morocco, but you can arrange it through local Tangier travel agency Travel Link, www.travellink.ma, 83 Rue de la Liberté (next to the El Minza Hotel), Tanger, call +212 539 93 58 77 or email both officetanger@travellink.ma & imad@travellink.ma. Travellink charge a hefty 500 dirham (£41) booking fee on top of the ticket cost, credit cards are accepted, but it can be worth it if catching this train the day you arrive in Tangier is mission-critical. Travellink have been highly recommended by five separate correspondents, although two other travellers say the agency seems to have bought their couchette tickets on the day of travel anyway (which defeats the whole point of using them, and in one case, they then found the couchettes full), and one other traveller reports poor service. Feedback if you book this train through Travel Link is always welcome. 4-berth couchette: Upper berth in a 4-berth couchette compartment on the Tangier to Marrakech overnight train... 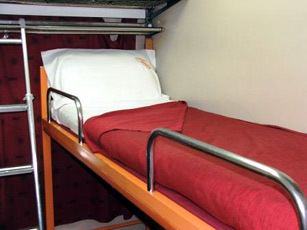 There are upper & lower bunks each side. Courtesy Patti White. Tangier-Marrakech overnight train: The 1st class 4-berth couchette car attached to the Tangier - Marrakech overnight train. Photo courtesy of Dave Turner. 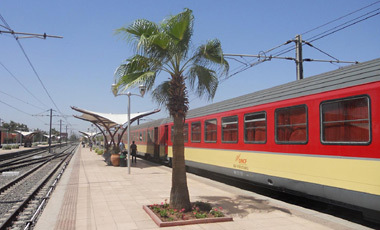 These smart new double-deck air-conditioned trains are now entering service on the hourly Rabat-Casablanca fast shuttle service (TNR or 'Train Navette Rapide' and a few Fez-Meknès-Rabat-Casablanca express trains. Buses link Marrakech with Agadir roughly every hour or so, journey time 3h30. Buses link Marrakech with Essaouira ever 2-3 hours, journey time 3h. You can check bus times at www.oncf.ma. Buses are run by Supratours, a subsidiary of Moroccan railways. 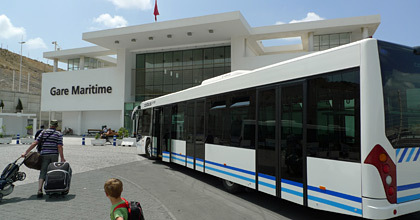 Buses leave from the Supratours terminal next to Marrakech railway station, so train-bus connection is easy. Marrakech - Agadir costs about 110 dirhams (€10), it costs a bit less to Essaouira. Luggage must be checked in, and a small fee of around 5 dirhams is payable for this in addition to your fare. Buy tickets locally. You can buy combined train+bus tickets from any Moroccan railway station to Agadir via Marrakech - ask for a billet rail et route. Make sure you take a good guidebook. Easily the best guidebooks for the independent traveller are Lonely Planets and Rough Guides. Both provide an excellent level of practical information and historical background. You won't regret buying one of these! In Algeciras: For Algeciras hotels, click here. I highly recommend the Hotel Reina Cristina, which is easily the best hotel in Algeciras as well as the most historic, set in its own grounds just 10 minutes walk from either rail station or ferry passenger terminal. It costs only about €53 per night for a single, €68 for a double. 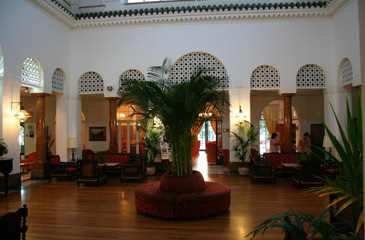 In Tangier, the classic and wonderfully atmospheric Continental Hotel is the top choice, and inexpensive. 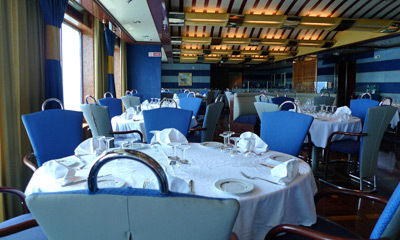 Ideally located for both port and old medina, and with its own restaurant too. It can now be booked online at Booking.com. In Marrakech, the Hotel Islane is a good mid-range choice at around €35-€45 (£26-£31) per room per night, with an excellent central location just round the corner from the Jemaa el Fnaa, the main market square. It also has a good rooftop restaurant. The most famous hotel in Marrakech is of course the top-notch La Mamounia Hotel, if you can (a) afford it and (b) get a room! 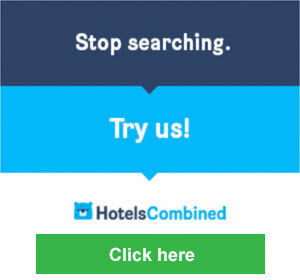 You can arrange hotels before booking opens for train tickets if you use a site with free cancellation such as www.booking.com. The classic Hotel Reina Cristina is easily the best place to stay in Algeciras, set in its own grounds just 10 minutes walk from both rail station and ferry terminal. It's well worth hiring a car south of Marrakech! Hiring a car isn't the first thing you'd think of in Morocco, but the roads are relatively empty and driving is surprisingly easy. If you've a few days to spare when you get to Marrakech I highly recommend hiring a car and driving south over the High Atlas Mountains via the absolutely incredible Tizi n Tichka Pass, perhaps the most amazing road I've ever driven. Stay the night at the Kasbah at Tifletout (now a hotel) and visit the Gorge du Dadès, Todra Gorge, and the remarkable mud-built town of Aït ben Haddou. Driving really isn't difficult, indeed the roads are far less crowded than in the UK or Europe, making it a very pleasant way to get around the countryside. Instead of searching multiple websites to sort out your car, try this search engine which compares different hire companies' prices.